Graduate of Warsaw School of Economics, holder of a postgraduate diploma in project management at the Kozminski University. As an advisor in the Department of Governance and Privatization at the Ministry of State Treasury in the years 2006-2007 he was responsible for coordination of selected tasks regarding sector consolidation, he issued opinions and prepared analyses related to the operations of the power sector, participated in drafting legal acts related to the scope of activities of the ministry. In the years 2007-2008 he held the position of director for strategy at TAURON Polska Energia, where he developed the strategy of the Capital Group, including general restructuring strategy and was responsible for coordination of the Group’s standpoint towards major legal acts under preparation. In the years 2008-2012 he was project manager at GDF Suez Energia Polska, where he coordinated and participated in projects, mainly in the scope of privatization of state-owned energy groups. He was also responsible for optimization of projects for development of conventional energy sources – he developed a business model of cooperation with external partners, participated in negotiations concerning partnership in project execution, was responsible for coordination of financial evaluation of development projects. In the years 2012-2014 he was the director for strategy and development at GDF Suez Energia Polska – Katowice. He was also responsible for market analyses and preparation of the company’s development strategy, regulatory management and M&A projects, he managed an international internal team and an international team of advisors. In the years 2014-2015 he was a manager for key projects development at GDF Suez (Branch Energy Europe) responsible for execution of M&A projects. He participated in drafting of sales and marketing development strategy in Europe. Over the last six months he was responsible for development of commercial strategy and contract for difference under a nuclear project in Great Britain. 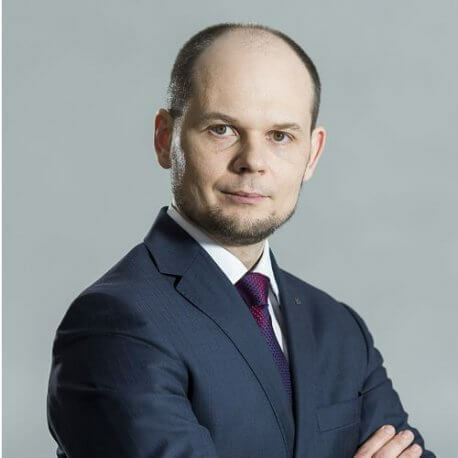 As Vice-President of the Management Board for Asset Management and Development at TAURON Polska Energia he oversees the following areas of the Company’s operation: asset management, research and innovation, investment projects, project assessment and analyses and occupational health and safety.